"It's a film about meat, about people who have gone beyond dealing with animal meat and rats and dogs and cats," said the director as the wind howled outside. "Crazy retarded people going beyond the line between animal and human." The film is, THE TEXAS CHAIN SAW MASSACRE, the director, Tobe Hooper, and the place, an old house just outside Austin which resembles the one in "Psycho". The Bryanston Pictures release opened in 1971.
true. 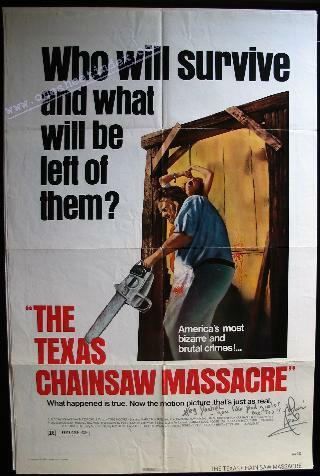 THE TEXAS CHAIN SAW MASSACRE script, written by Kim Henkel and director Hooper, takes off from this point of departure to create a crazy family of four men who terrorize and finally kill all but one of a group of youths traveling through a sparsely populated part of Texas. Indoor scenes of the film were shot at night to avoid the heat. The set, the den of the grisly family is an imposing, cluttered mess of chicken feathers, simulated splattered blood, and, of course, bones, bones, bones. Lamps, chairs, ashtrays, footstools, and objets d'art all made of bones festoon the room. Pelts and skins also decorate the wall. "We used parts of eight cows, two dogs, a cat, two deer, three goats, two real human skeletons, one chicken, and an armadillo," said Robert Burns, the set's designer. "There are only about 10 plastic bones in the whole set." The effect is eerie. At times, one could all but smell the bloodshed, both animal and human, which the house was supposed to have contained; at other times, it would all seem too much and become morbidly comical. The sky darkens. A wind blows up. It looks like rain. And the house, seen from outside, starts to look more and more haunted, more and more ominous. The crew, too busy to notice, is constructing a plywood screen on the porch to protect the camera if it should start to shower. But the rain never comes and shooting begins unbothered by the world outside. The scene begins with two of the brothers entering the house, carrying a female intruder, Sally, wrapped in a gunnysack. Leatherface, named thus because he always wears human masks, comes in from the kitchen. He is wearing a mask from the face of an old lady, more comic than terrifying. And with the apron around his huge torso, Leatherface now looks more like an oversize grandmother from a TV situation comedy. The effect is both serio-comic and a bit off-putting; it will look either very inventive or ludicrous on screen. As Leatherface comes in, making animal-like grunts, his brother angrily chases him back to the kitchen, beating him off camera with a stick and shouting, "You damn fool!" The shot is comparatively simple, with one long "cover" shot containing a single short zoom. A close-up, to be inserted is also to be made. Once the camera and lights are ready, Hooper runs through the action and blocks it with the actors. He directs three takes of the whole before proceeding to the close-up. Sally struggles convincingly, the actors all hit their marks, correctly, there are no technical problems: the takes should be fine. Watching Hooper direct holds certain surprises. He is a rather small, slight-looking man, and, with the exception of the big cigars he smokes, he is devoid of Stroheim-like extravagances on the set. Yet he exudes, at least on that night, a self-assurance and authority, and above all a calm as he works. For such a young man (30) with only one feature behind him ("Eggshells", which had its Austin release last year) he nonetheless gives the impression that it should be him, Hooper, in charge and not one of the crew, many of whom are graduate students in film at UT and are fairly accomplished, if fledgling, directors in their own rights.